Trainer Tony McEvoy predicted better wins ahead for Winning Partner, an easy maiden winner at Bendigo on Cup day, Wednesday, October 31. “He’s a nice horse this fellow,” McEvoy said. 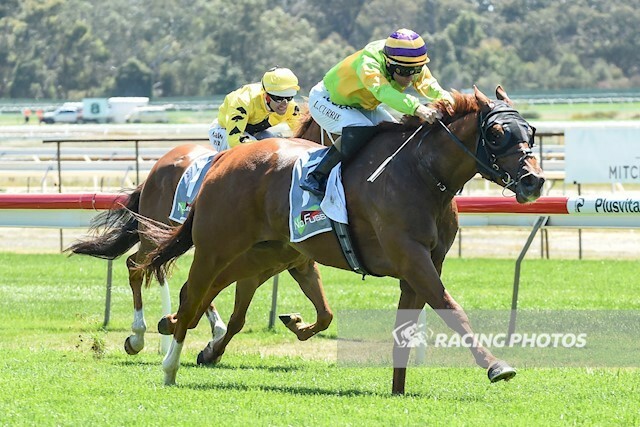 Well backed at $2.40, Winning Partner, with Luke Currie in the saddle, overcame a slow start in the No Fuss Event Hire Maiden (1110m) to round up his rivals and win by 2-1/2 lengths from Celeritate Regem ($41) with Fergus Magergus ($41), three-quarters of a length away third. “I’ve always had an opinion of him, but the owners agreed to allow him to be gelded after his last run in June and I’m sure it will be the making of him as a racehorse,” the trainer said. “Normally I give my horses a few trials before racing them but he is a clean-winded fellow, so he had just the one at Cranbourne because I didn’t want him to get behind with his fitness level. McEvoy said the $150,000 VOBIS Eureka Stockade (1400m) at Ballarat on Saturday, November 24 was a likely next target for the winner before heading to Queensland for Magic Millions races. Winning Partner is owned by Glenvallen Investments Pty Ltd from Hong Kong in partnership with the Seymour Bloodstock of South Australian owner Darren Thomas. McEvoy said Thomas was a great supporter of thoroughbred racing. Winning Partner cost McEvoy Mitchell Racing just $110,000 at the 2017 Magic Millions Adelaide Yearling Sale and on the Bendigo win looks certain to prove an astute purchase.